SPOT ON AT THE EVANS-MOORE CUP! 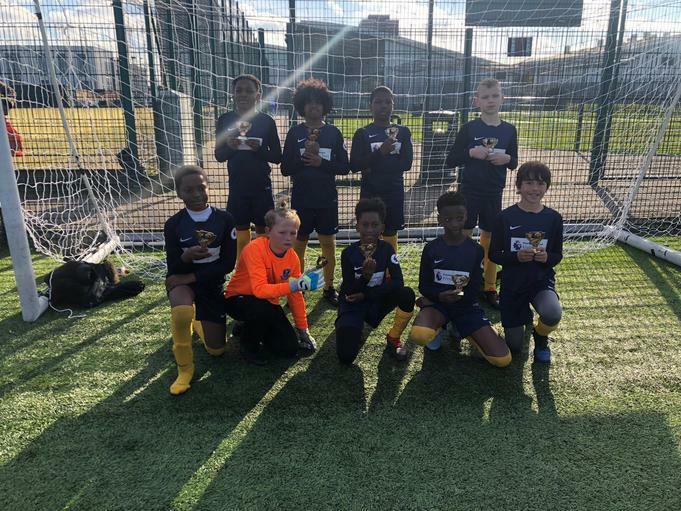 A feast of football was enjoyed by all at Robert Clack Leisure Centre, as 130 Year Five and Year Six pupils took part in the annual Evans –Moore Cup 7- aside competition. Fourteen schools took part and the tournament consisted of 53 matches! This year’s event proved to be the most closely contested and exciting for more than twenty years. It was a brilliant advert for schools’ football and many remarked on the fantastic atmosphere of sportsmanship and fair play that was clear for all to see. In the group stage all teams played six matches. In Group One it seemed that Richard Alibon was the team to watch, as they won four matches and drew two. They were clear winners of the group. Valence Bonham was second, with Grafton in third place. Ripple (eventual finalists) only scored one goal in the six matches, but they had a better defensive record than William Bellamy, who despite having the same number of points, were squeezed out of reaching the knockout stage on goal difference. Beam and Roding Hewett had played impressive football at times, but failed to amass the points needed to reach the quarter finals. George Carey School was the worthy winner in Group Two, beating every opposing team and scoring the most goals. Valence St George (last year’s winner) remained unbeaten and proceeded to the quarter finals with St Joseph’s Barking and Roding Cannington. Five Elms, Godwin and Hunters Hall had provided worthy opposition for the top four in the group, but were unable to reach the next stage of the competition. Bonham and Ripple were in different ways worthy finalists. Valence had played well as a team and scored goals when it really mattered. Ripple had never given up, even when the odds were against them. The final ended in a 0-0 stalemate after extra time, so the dreaded penalty shootout came into effect yet again. It was Valence Bonham that won 3-2 as one of the Ripple penalties narrowly missed the target and cruelly hit the post. The silent tension of the penalty shootout was now replaced by cries of jubilation as Bonham players now realised they were now the winners of the Evans Moore Cup!